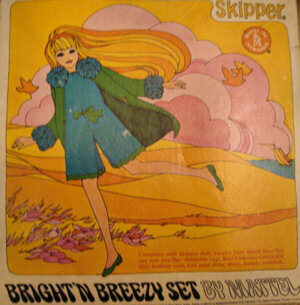 There were three different versions of TNT Skipper. In 1969, her hair style changed to sausage curl pigtails. 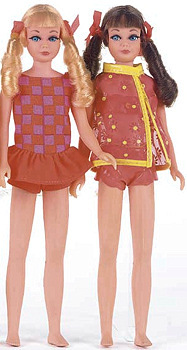 Twist and Turn dolls have a twistable waist and are called TNT by collectors. one with hot pink and dark blue stripes. There were also versions with woven fabric and also with knit fabric. 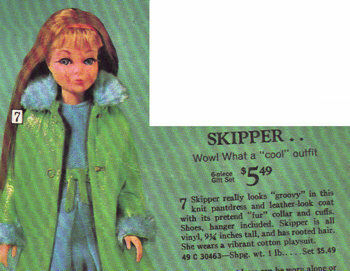 Like the American Girl Barbie, some of the earlier TNT Skippers (with straight hair) have what is called "high color", meaning they have more noticeable or darker blush on their cheeks. 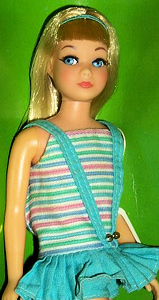 These dolls are more desirable to collectors and are generally more valuable. This is a very hard to find Sears Exclusive Gift Set from 1968. This Sear's Gift Set from 1969 is also hard to find. This ensemble is sometimes referred to as "Wow! 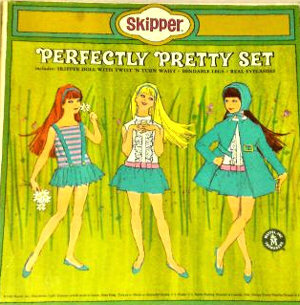 What a Cool Outfit" because that is what it was called in the 1968 Sear's Christmas Catalog.